Durham Cathedral has won the Hudson’s Heritage Award 2017 for Best Innovation for its clever and highly successful fundraising project where visitors were encouraged to buy a LEGO brick which was then added to a detailed model of the cathedral. In November last year it also won Most Innovative Fundraising Campaign at the Institute of Fundraising Awards. Open Treasure is a new world class permanent exhibition in the original monastery buildings at Durham Cathedral showing the cathedral’s collection of stone carving, church plate and metalwork. It was made possible by an innovative, clever and highly successful fund raising project. 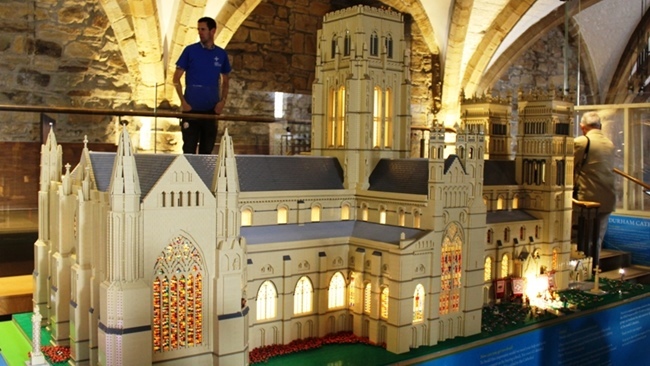 Visitors to the Cathedral were encouraged to buy a LEGO brick which they added to a detailed model of the cathedral. Between July 2013 and July 2016, 300,000 bricks were sold at £1 each and the resulting model has captured the imagination of visitors of all ages. Bricks were added by people from 182 countries. The result is an accurate scale model of one of Britain’s greatest medieval buildings nearly 4 metres long and not far off 2 metres high. It has great visitor appeal, opening to reveal a full reconstruction of the interior complete with architectural detail. For Christmas 2015, there was a miniature Lego Christmas tree lit up to match the 20ft Norwegian Spruce in the main cathedral. And in 2016, the famous Miners’ Festival service was recreated in LEGO complete with Banners. There were also spin off benefits from the sale of popular LEGO merchandise in the Cathedral shop. It has been a brilliant fundraising campaign, achieving its objective and more and is now not surprisingly being copied in other cathedrals.